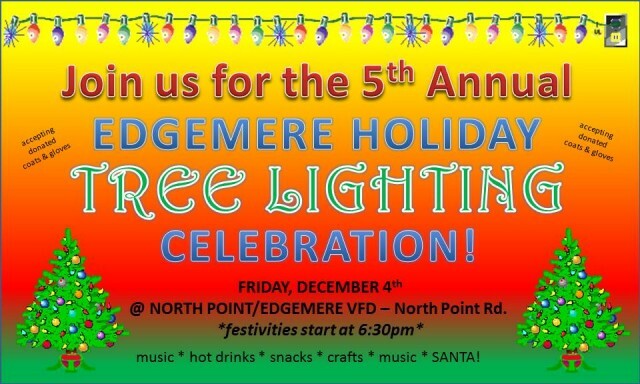 ALL are welcome to join us for our newest tradition (started in 2011), the annual Edgemere Community Tree Lighting Celebration located at the North Point/Edgemere Volunteer Fire Department on North Point Road (next to Food Lion). It's FREE! Families are treated to free hot chocolate, cider, holiday treats, music, caroling, kids crafts and the BIG MAN HIMSELF helping us light up the tree! Check our website for the date and time each year! Merry Christmas & Happy Holidays!